"This cake has a reputation! 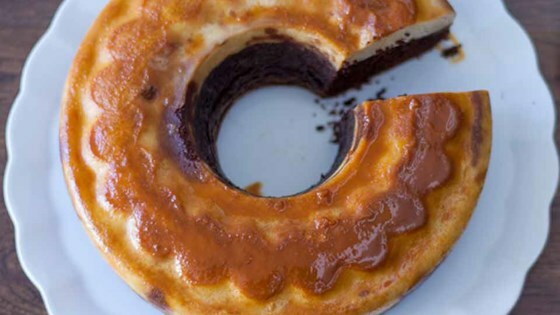 A sweet and tempting caramel is drizzled into a greased Bundt® pan, followed by a gorgeous smooth mixture for a moist and rich chocolate cake and a layer of flan. Serve topped with more melted cajeta if you wish." Preheat oven to 350 degrees F (175 degrees C). Grease the base and sides of a 10-inch fluted tube pan. Dust lightly with flour; tap to remove excess. Fill a shallow baking pan with enough water to come 1/3 of the way up the sides of the tube pan. Place water bath in the oven to warm up while it is preheating. Pour caramel sauce into a microwave-safe bowl. Microwave until warm and pourable, about 1 minute. Pour into the prepared tube pan, covering the base completely. Mix flour, cocoa powder, baking soda, and baking powder together in a bowl. Beat 1/2 cup plus 2 1/2 tablespoons butter in a bowl with an electric mixer until smooth. Add sugar; beat until light and fluffy. Beat in 1 egg and coffee. Alternate adding flour mixture and milk, mixing well between additions. Pour cake batter evenly over caramel in the tube pan. Combine evaporated milk, condensed milk, 4 eggs, and vanilla extract in the bowl of a food processor; blend until smooth. Pour over cake batter through a fine sieve. Bake in the water bath in the preheated oven until a toothpick inserted into the chocolate cake comes out clean, about 1 hour. Let cake cool, about 1 hour. Carefully run a thin knife around the edges to loosen the cake, cover with a serving plate, and flip onto the plate. Impossible? No—but this chocolate flan cake IS impossibly delicious! You can replace the cajeta sauce with a traditional caramel if preferred. Gently heat 1/2 cup white sugar in a saucepan over medium-low heat until melted and golden brown, then pour into your greased and floured pan. This is a Mexican ChocoFlan . I make it all the time...so very delicious. The chocolate cake soaks up the milky creaminess and makes it heavenly.